Remove unsightly swirls with our dream team – Wolfgang and Porter Cable! The Wolfgang Porter Cable Swirl-Free Kit eliminates swirl marks, polishes paint to a pristine shine, and seals the paint for lasting beauty. Can one kit do all this? Absolutely! The Wolfgang Porter Cable Swirl-Free Kit is a total car care solution. 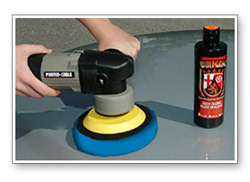 Use the Porter Cable 7424XP dual action polisher and Wolfgang Concours Series to take your vehicle from ordinary to extraordinary! This kit includes Lake Country's CCS Dual Action 6.5 inch Smart Pads™ Foam Pads. These flat full contact buffing pads work with your dual action polisher to correct automotive paint more easily than ever before. The CCS Smart Pads™' user-friendly features provide better control, less product waste, and a more successful detail. Wolfgang Total Swirl Remover 3.0 is a hybrid of our original Total Swirl Remover formula and Germany’s fast-cutting polish for ceramic clear coats. It combines Wolfgang’s diminishing abrasive technology with a special milling process pioneered in Germany, which produces consistently sized, fast cutting abrasives. Our specially milled abrasives work to eliminate imperfections without creating new ones. These small abrasives are milled for consistency. As they smooth over a scratch, the abrasives diminish at the same rate because they all started at the same size. The result is smooth paint in fewer steps. 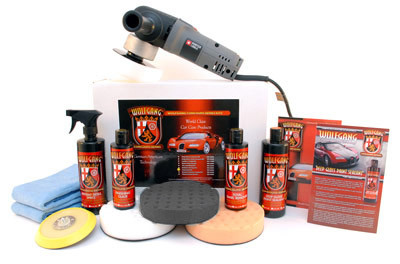 If another step is needed to fully restore the gloss, simply switch to a softer foam pad. Wolfgang Total Swirl Remover 3.0 works more or less aggressively based on your pad selection. 8 oz. Wolfgang™ Finishing Glaze 3.0 is a fine grade polish full of lubricating oils and mild diminishing abrasives. 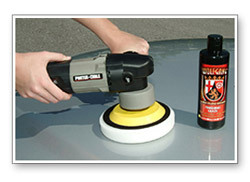 It will smooth and brighten the paint while eliminating any roughness that may have resulted from swirl removal. The oils "wet" the paint to achieve a deep, liquid gloss that exceeds the results of wax alone. Use Finishing Glaze prior to the application of a wax or sealant for a stunning, high gloss shine. 8 oz. 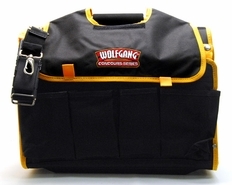 Wolfgang Deep Gloss Paint Sealant 3.0 features fortified polymer technology. Wolfgang's German Super Polymers are fortified with more dirt-repelling power to keep your vehicle cleaner and shinier, longer. Our enhanced super polymers have an amazing anti-static property that repels water, oil, dust, and road grime to provide unsurpassed paint protection. Your vehicle stays cleaner because foreign molecules literally slide off the clear polymer coating. Super polymers bond easily to automotive paint and form an extensive cross-linked polymer network. This clear shield eliminates surface tension so contaminants have no foothold on your vehicle. Your vehicle will have a deep gloss and unbeatable protection for months. 16 oz. Drawing from ground-breaking developments in modern chemistry, the specialized ingredients in this high-lubricity spray deliver unparalleled surface enhancement--clarity, intensity and shine. Though most cars can be misted and buffed in less than five minutes, it will look like you've spent all day laboring on your vehicle. Wolfgang Instant Detail Spritz is formulated with high-tech German super polymers. These highly-reflective polymers form an ultra-thin protective coat that bond to the paint sealant or wax finish and leave your vehicle with a slick, silky surface—plus Instant Detail Spritz extends the life of the sealant or wax with regular use. 16 oz. The imported orange pad is made of firm, high density foam for scratch and defect removal. Use this pad with polishes, swirl removers, and light compounds. It's a versatile pad that will remove most light to moderate imperfections, including swirls, scratches, and light oxidation. The white pad is a less dense foam formula intended for the application of cleaner waxes, micro-fine polishes and all-in-one sealants. This pad has very light cleaning power so it's perfect for pre-wax cleaners. Swirls, your days are numbered! The Wolfgang Porter Cable Swirl-Free Kit is full of all the products and tools you need to restore a smooth, swirl-free finish to your vehicle. First use the Wolfgang Total Swirl Remover 3.0 with the orange pad. Set the speed of the Porter Cable between 4500 and 5000 OPM. Work in sections and buff away the residue before moving on to the next section. 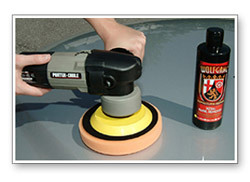 To finish up, apply the Wolfgang Deep Gloss Paint Sealant 3.0 using the finishing pad. Cover the entire vehicle and wait 30-45 minutes before buffing. Once buffed, the sealant needs to cure for 12 hours in absolutely dry conditions to achieve the full effect. 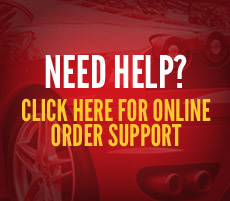 Please call for a quote for next day air, 2 day or 3 day expedited shipping on this item. 1-800-547-8109.